A man in his 40s was admitted to the hospital with a 10-day history of edema and presented with vesicles and bullae on his right cheek, neck, back, both eyelids, and the dorsal surface of his hands (Figure 1A). 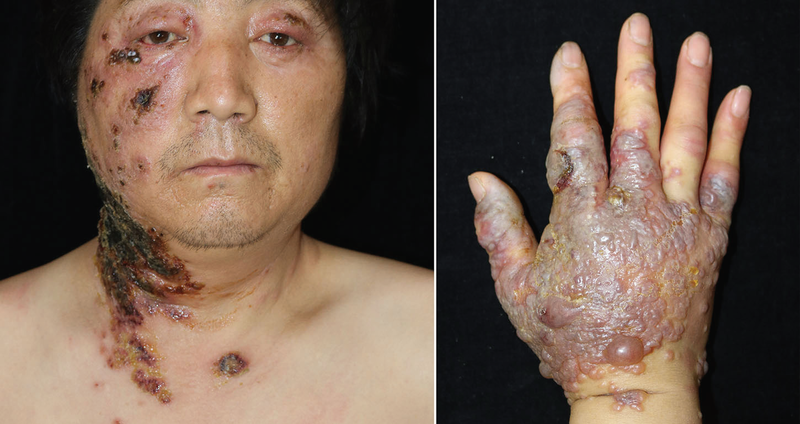 Prior to presentation, he had been treated for herpes zoster with famciclovir for 1 week, during which the lesions kept developing and were accompanied with irregular fever (maximum temperature, 39°C). Physical examination revealed edema on both eyelids; multiple papules, blisters, and crusted erosions with thin exudation on his right cheek and neck; and erythematous plaques and tense blisters and bullae on his back and on the dorsal surface of both hands (Figure 1B). A full laboratory workup was performed for autoantibodies for systemic lupus erythematosus (SLE), pemphigus, and bullous pemphigoid; skin and bone-marrow biopsies and direct immunofluorescence were performed; and immunohistochemichal analysis, a swab of exudation, and bacterial, fungal, and atypicalmycobacterial cultures from blood and tissue were also examined.